Light Up Fidget Spinners - Many companies have the standard fidget spinners but if you are looking for something that will catch anyone's attention, then you need to get the light up fidget spinners. They light up when in use and create a really good effect both during the day and at night. Not only does it light up but it lights up with LED lights that really change the entire premise of the toy. Holiday and Event Themed Fidget Spinners - You can really customize the fidget spinners that you give out based on the surrounding holidays or the event that you are hosting. You can choose from different themes such as pumpkins, Santa's, snowmen, awareness ribbons, and much more. You can go much further than the standard available colors of most other fidget spinners. Business Customized Fidget Spinners - Beyond event ideas, you can even get some fidget spinners that go along with what you do for a living. Your business can have its own fidget spinners as part of marketing and advertising. Some available options include getting house themed fidget spinners for construction or real estate companies, earth themed fidget spinners for travel companies, and more. With all of our unique fidget spinners, the opportunities are endless. You can do so much with the options available to you and you do not have to risk having the same ones as anyone else. For more information on our fidget spinners or for some more ideas and options, feel free to contact us today or check out our website at PromotionPros.com today. Today, being active is the goal, whether to lose weight, de-stress, or just get outdoors. National Walk Your Dog Week, founded in 2010 by Pet Lifestyle Expert and Animal Advocate Colleen Paige, helps dog owners and their dogs do exactly that. Walking Alleviates Stress for Everyone, Even the Dog! Be honest, a quick walk around the block isn't enough activity for you OR Fido. But 30 minutes of walking, three times a week, lowers blood pressure and can reduce your weight by 5% (15% for your doggy partner). Amazing, right? In fact, lack of exercise can also result in destructive behavior, aggression and separation anxiety for a dog. National Dog Week strives to help build a habit to prevent those issues. When your business acknowledges that health connection between owner and dog, you connect with real life for your customers. Sponsor an event in your area and consider our woven pet collars with your pet store, veterinary hospital or boarding kennel logo, as a giveaway. Celebrate National Walk Your Dog Week by starting your own event! Collapsi-Bowls are an obvious choice for pet fundraisers, doggy walks, or even offering as an item for sale in the weeks leading up to the celebration. They're perfect for hikes and a quick drink on the go. The carabiner makes them an ideal take along that can clip to a belt, our silk-screened logo leash or even a doggy backpack! Bag dispensers are another great gift idea that not only promotes health and walking but also keeps trails and parks clean. No celebrations in your community? Consider the great ideas found on the National Walk Your Dog site! From costume parades, to library walks, to hospital visits, there are many ways to get out there with the dogs and promote health for owners and their furry companions! 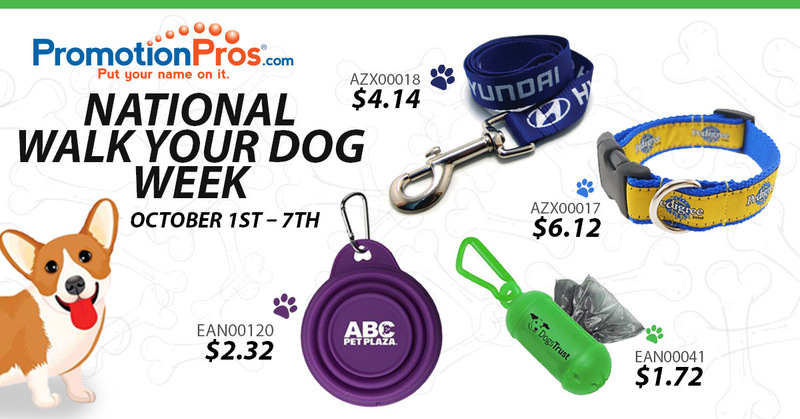 Celebrating National Walk Your Dog Week and looking for a way to make your presence memorable? Give us a call today, we've got lots of great ideas and are waiting to help. If your business or organization is related to healthcare, or women's health, or your customers or staff are women, take a stand in support of breast cancer awareness. Men also get breast cancer. According to the National Breast Cancer Foundation, approximately 1 in one thousand men will be diagnosed. Is that news? Actually, that's what the whole awareness thing is about, spreading the word, educating your community, and bringing a common disease out into the open to talk about. Why not make this the year that your business takes a stand and show you care! Fidget spinner are hot items right now. Why not sell our awareness spinners as a fundraiser and make a donation to a local hospital? Or consider creating a breast cancer awareness basket for each of your locations, and sell raffle tickets, with proceeds going to Susan G. Komen or a local women's health clinic. Giving to your immediate community, especially for a cause that is impactful to so many can really spread the word about your brand, and may even be a great PR opportunity. Breast cancer touches everyone. During Breast Cancer Awareness month, create a company team for a local Making Strides Against Breast Cancer walk. 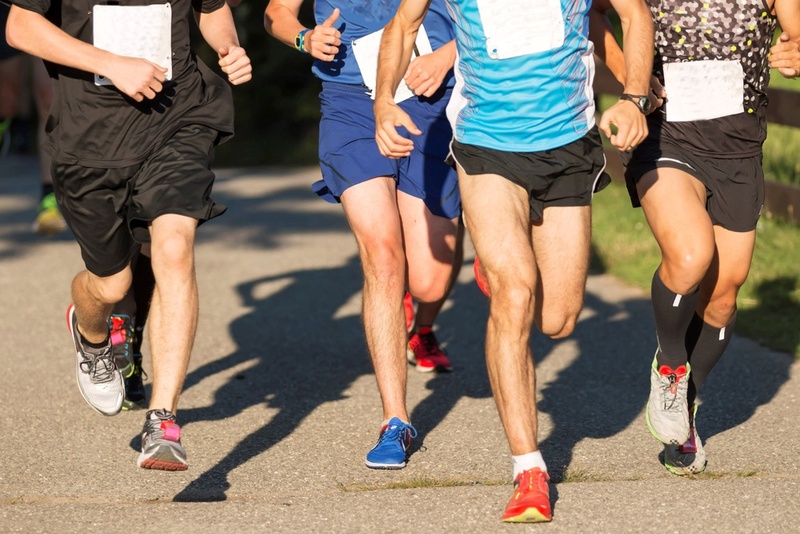 The American Cancer Society's site offers team tips and sign ups. If you do decide to create a team, or an entire event, our Sport-Tek 1/4 zip pullover in Pink Raspberry supports your Go Pink! efforts, and can feature your company's logo with an inspirational message. 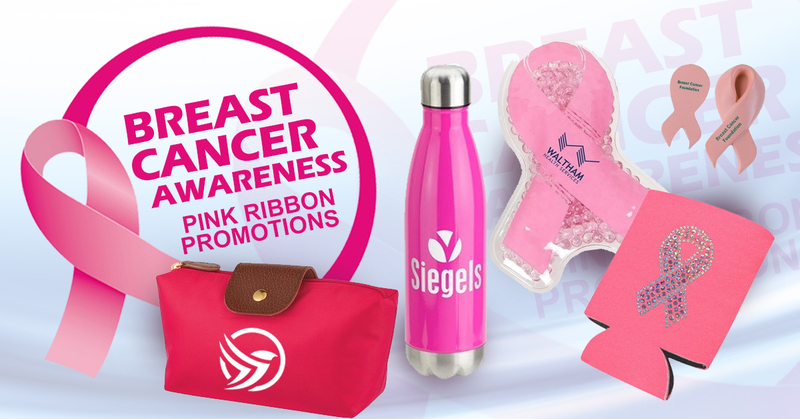 For non-walking employees or customers, select an item they can keep on their desk to support the cause throughout the year. Our Hulo pen in pink with a company logo is a simple choice that everyone can use. Breast Cancer Awareness month and Making Strides Against Breast Cancer activities are focused in October, but research never takes a break. Your company can help spread the message and support those impacted by this disease all year round. Let us help you select the items that will work best for you. Call us today. Now that the school year has started, along with it comes a lot of sporting events. If you are involved in sports of some sort, whether or not it is through a school, then you are likely in need of a few spirit items so ensure that everyone gets into the team spirit. This list of items can do the trick for you while ensuring that you stay within budget. Mini Vinyl Footballs. If football is your sport and you want to make sure everyone gets more into the game, then mini vinyl footballs may be the answer. You can get the logo of your team on the footballs and then throw them into the crowd for everyone to enjoy. We also have rubber footballs if you are looking for something a bit more durable for your fans. Noise makers are another great thing to have as spirit gear giveaways. Our personalized Fan-ta-Stick pairs can be purchased in your team colors and you can add the logo or fun sayings such as "go team!" on the side. Other noise makers that you can choose are our fun cow bells that are available in several colors. If you are looking something to give to the adult crowd, then our collapsible water bottles are the perfect giveaway. They are small, compact, and hold enough water for the game. For something a bit more durable, then consider some of our stainless steel bottles. These can be great for all fans and can take a beating throughout the entire season. Your fans are likely going to be carrying around a lot of stuff to the games. If you want to provide them with something that is personalized that they can use to carry it all around, then our string backpacks are the perfect solution. With so many options, all that is left is to choose the right items for your team and events. This is just a sampling of the items that we have available. To see everything else, be sure to check out our Promotion Pros website or contact us today. There’s an ugly rumor going around that techie types don’t care about anything but their algorithms and such. The truth is, they will have your attention when you offer these great promotional items. Each item is inexpensive and will keep your company or cause visible and memorable. The Q1 Discus Wireless Charger offers your customers a unique way to keep their devices powered all the time. This charger has a 5V output and features a blue LED light that indicates when it is in use. Comes with non-slip silicone ring and padded feet. The white colored body gives your custom imprint maximum visibility and impact. What better way could there be than to listen to your promotional message that on these Boompods Bluetooth Headphones featuring your brand? The headphones have an illuminating headband with different light modes: flash fast, flash slow, permanently on or off, that keeps the user visible in dimly lit surroundings. Volume and track controls allow adjustment of volume, skipping songs, and answering calls with a one touch button. ERGO Grip earbuds that are included come in three different sizes to ensure a comfortable fit while on the move. The IN2 Virtual Reality headset will enhance your customers' video and gaming experience and keep your brand forefront in their mind. Made with superior quality silicone and ABS, these headsets are compatible with most 5.5"smartphones. Offers a large imprint area that is visible when in use or stored. You won’t be forgotten if you give even a non-techie this unique and useful gift. The Timebox Smart Wireless Speaker features the latest Bluetooth technology that connects to any handheld device for dynamic stereo sound. Other features include a built in microphone, FM radio, 15 custom alarms, voice messages, thermometer, social media notifications, and a professional sleep-aid system to improve sleep quality with natural sounds. Available in wood and black colors. Be sure and take the time to check on these items and others in time to have them before your next event. 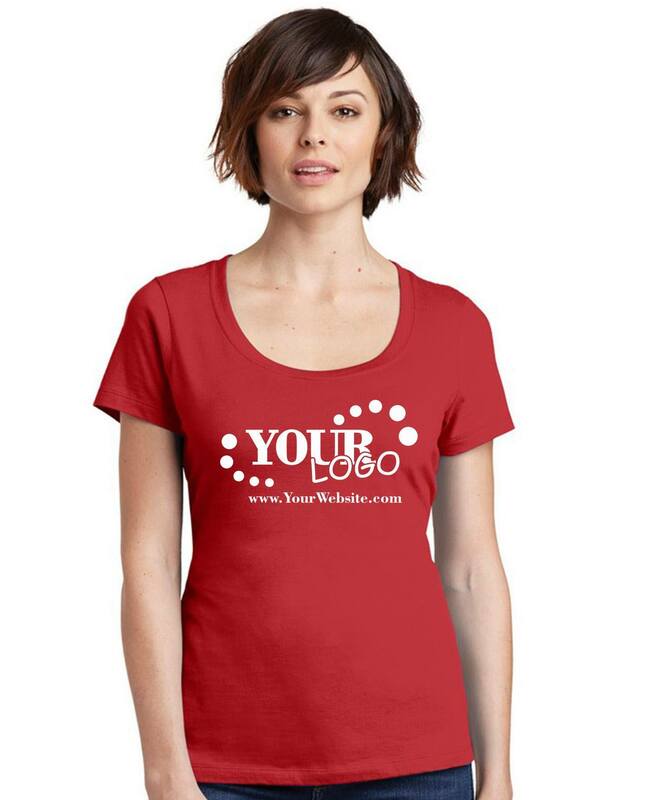 All of these items offer ample space for your logo or company name. They will ensure that you are not forgotten. Family reunions can be extremely fun. Many families try to have an annual family reunion but if you really want to take it up a notch, you should consider getting some promotional items that will make it even more special. This year, instead of just having everyone get together, you should consider using these promotional items as well. Themed Shirts. One of the basic items you should have every year is a shirt. You can create your own design and make it unique for every year. You can even give your annual family reunion a name, if you haven't already, and incorporate that. There are women's and men's sizes available to meet all of your needs. Bags. 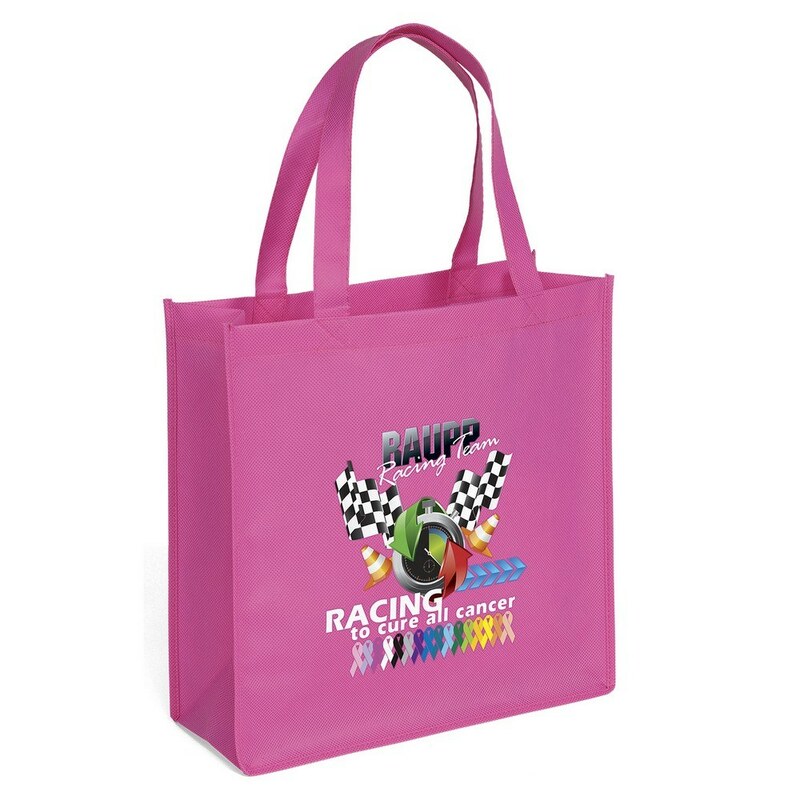 Make packing a breeze for all the members of your family by getting personalized bags made. They can use these bags to pack for the trip and there will be no questions about which group they belong to. If you are traveling by plane, then picking them up at baggage claim will be easy as well. Sunglasses. Sunglasses are a great addition for your family reunion, especially if you are going somewhere like the beach or another location with a lot of outdoor activities. You can be sure that your family will get a lot of use out of them during all of your fun outdoor activities. They can also continue to use them after the trip. Drinkware. This is another solid choice to make. 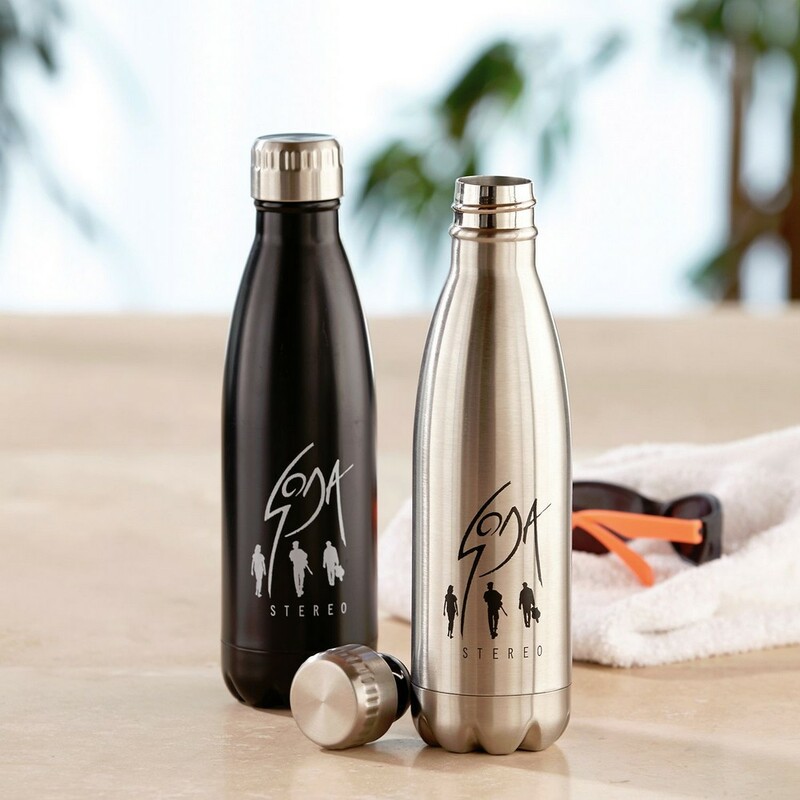 Whatever type of drinkware you choose, you can be sure that your family will use them to stay hydrated during the trip. They can also continue to use these throughout the year whenever they want to. There are many different types of drinkware that you can choose from to make your family reunion more special. There are so many ways you can incorporate promotional items into you family reunion. These ideas are just the beginning and you can take it even further by finding some that are specific to your theme or your location of the event. For more information and ideas, be sure to check out Promotion Pros. Want to make sure your company picnic is a memorable experience? Here are a few tips to keep in mind. Plan Activities for Your Audience – Think about who’s coming to the party. The ages of your guests. Choose fun activities that will fit the audience at your party. Have a Theme – A good theme for your party adds a fun element and changes up the atmosphere. Offer Some Shade – Fun in the sun is great, but too much sun can be a problem. Ensure your venue has some shade so guests can get out of the sun. Make the Menu Fun – Sure picnic staples are always great, but consider trying a few things that are a bit different to take your picnic to the next level. Investing your employees with a great company picnic may seem like a waste of money, but it actually will pay off. A good company picnic can show your employees that you support their families, it helps break down walls between departments, it inspires gratitude from employees, and it shows that you’re committed and devoted to your employees. Of course, you don’t want your party to be a flop, so here are some helpful tips and ideas to remember for an exciting event. Tumblers – When it’s hot outdoors, having a reusable tumbler is perfect, and double wall tumblers make perfect items to add to swag bags at your picnic. 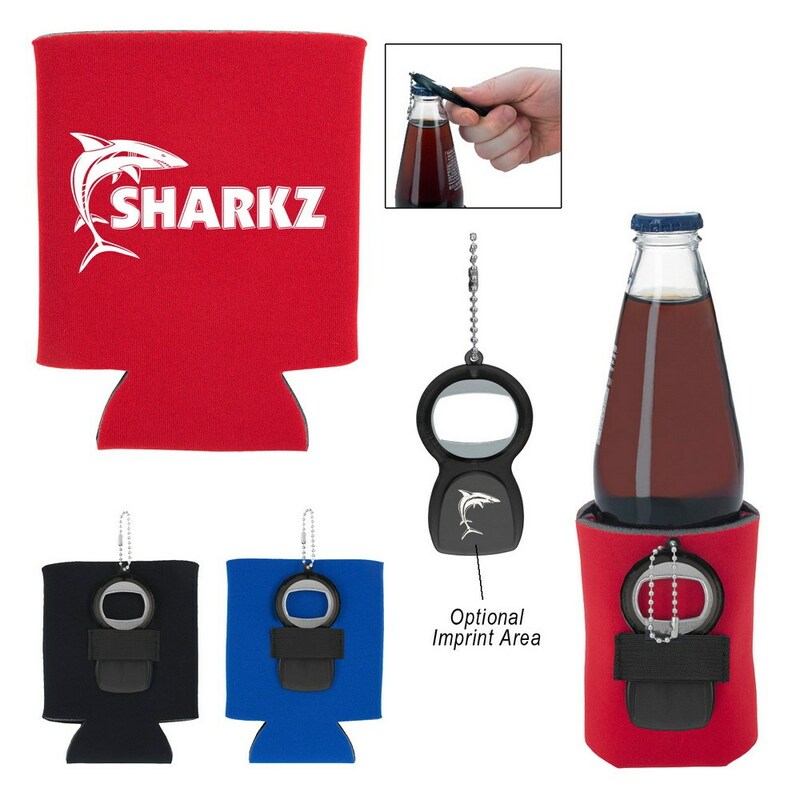 Kan Koozie WITH a bottle opener – Keeping with your picnic theme, branded can coozie with a bottle openers also make a great promo product that are reasonably priced enough to give out to everyone. 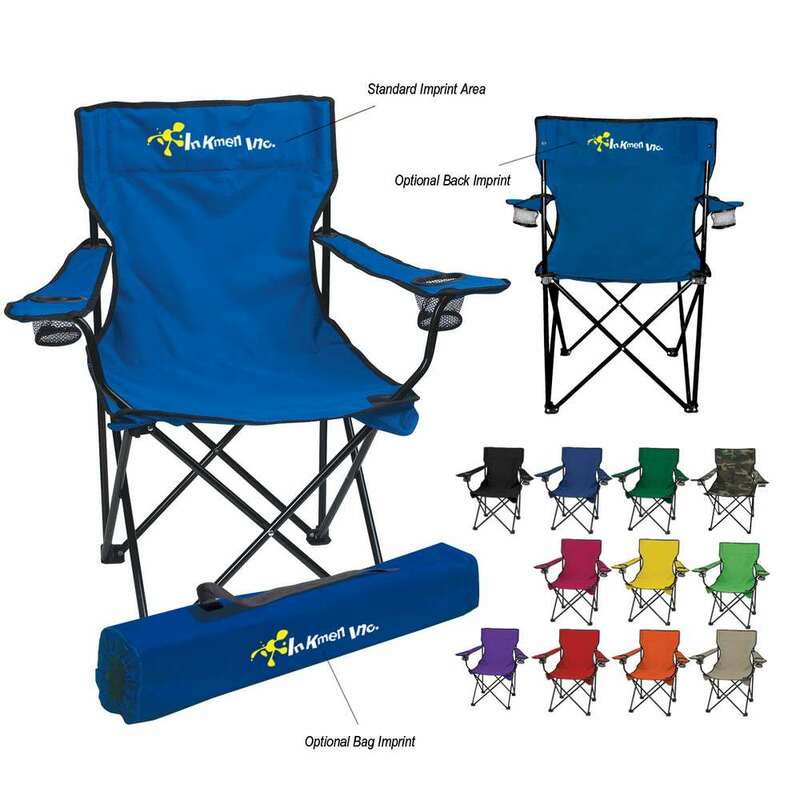 Folding Chair – If you want a more expensive giveaway or prize item, folding outdoor chairs that come with a handy carrying bag are perfect. They’re great for camping, the beach, or picnics and you can choose from many different colors. 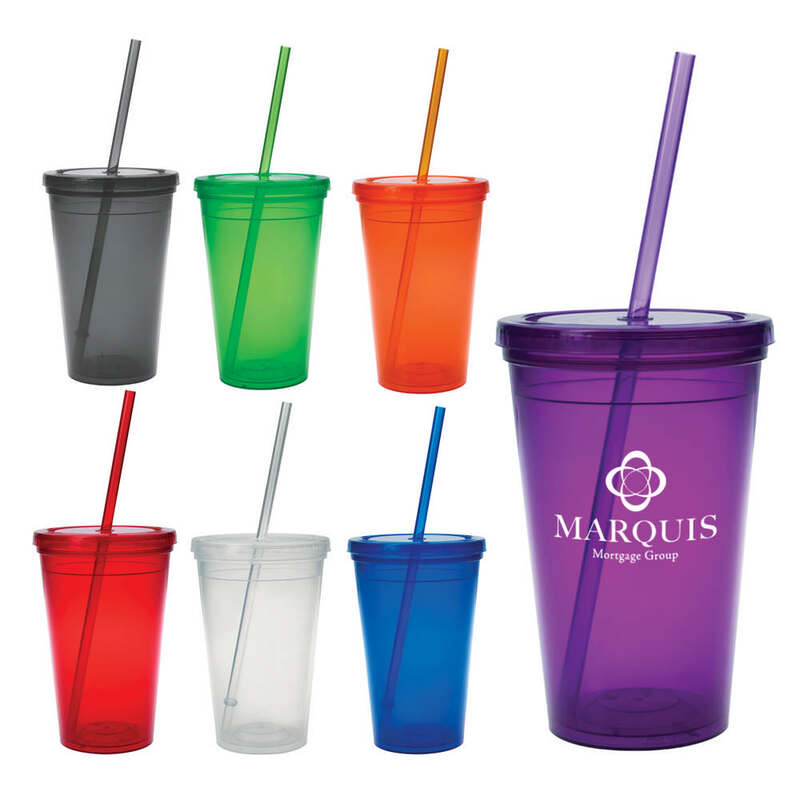 Make sure you have exciting promotional products for your next summer office party. Stock up before the big event and get ready to party. 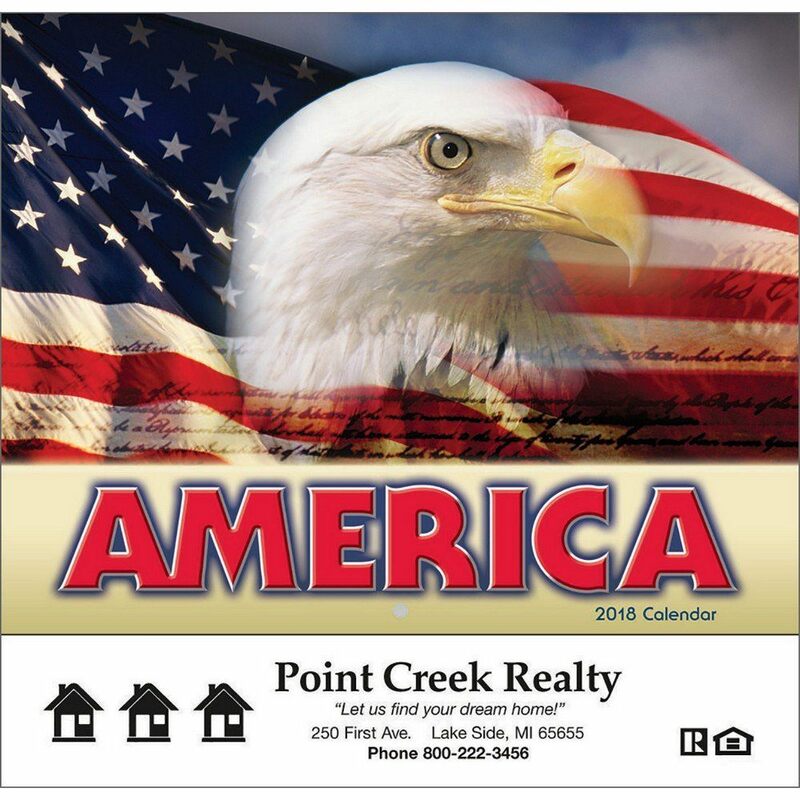 Promotional Calendars - You can get a calendar made with your branding on it. The benefit of calendars is that they will be displayed for an entire year ensuring that your non-profit stays in their mind. This is especially a good idea for people who work at companies that match donations. When they are prompted to donate for the match, your non-profit will be staring them in the face. Drinkware - People love getting cups and water bottles that they can use over and over again. If you want your non-profit to be visible not only to the person using the item then this is a great option. You will be able to reach many more people and trigger a conversation between them. Bags - Another great item that can be used to increase visibility all around town is a bag. You can have totes, drawstring bags, or even business bags. These can be used in a variety of manners and people will be seeing them all over town. You can give away these items at events or at your location. Some examples of events include a golf tournament or a local festival or fair. You may want to get items that are in line with those events too. With the right items for the event and planning, you will have more recognition in the community in no time at all. 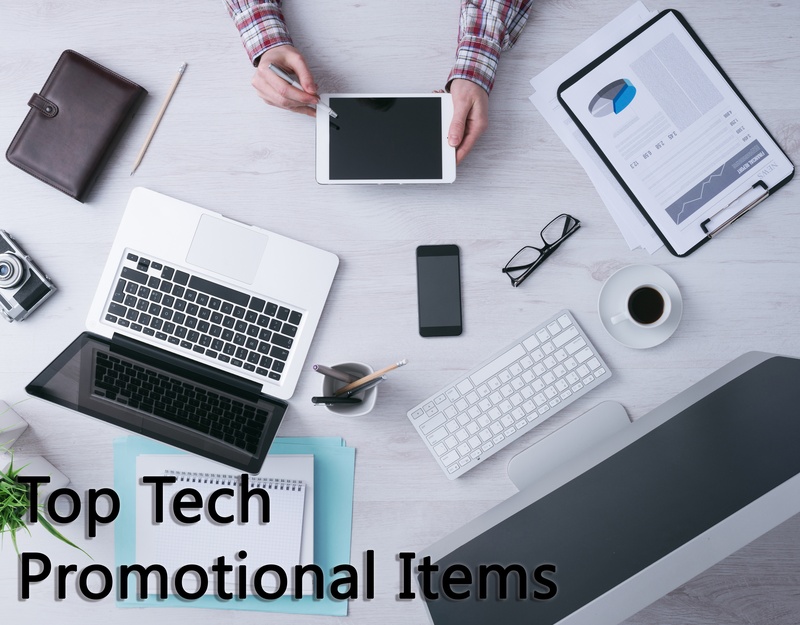 For more information on your promotion product options and for more ideas to increase your recognition, contact Promotion Pros today or visit their website.